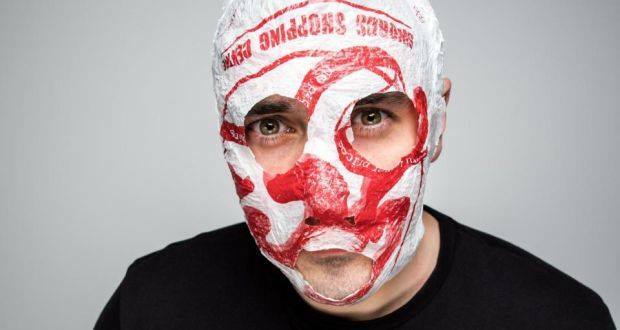 As part of the Dublin Podcast Festival 2018, Blindboy Boatclub from the Rubberbandits performed at Vicar’s Street. The Blindboy Podcast has gained a large listenership since it launched in October 2017, so much so that it quickly sold out the venue. Blindboy describes his podcast as ‘an eclectic podcast containing short fiction, interviews and comedy.’ He has become known for talking about mental health in Ireland and discussed his own mental health and his concerns about the state of mental health in Ireland on the Tommy Tiernan show in February 2018. He often speaks in strong favour of Cognitive Behavioural Therapy and thinks that cognitive psychology should be taught to young children in school so people have the words to describe what they’re feeling and why they do things. Vicar Street is an intimate venue hosting just over 1,000 people. The ground floor was covered in low tables and stools. “It’s a conversation, not a gig,” tweeted Blindboy a week before the show. The show was very relaxed and informal. The stage had a simple, centred setup of two chairs, a table, two mics and a spotlight. Blindboy casually strolled in carrying a can of beer and smoking his vape, that he ensured was only water vapour and part of his act. He sat down and introduced himself and then read a short story from his book, The Gospel According to Blindboy. He does this in all his episodes and this time it was about two boys from Cork, who fantasised about poisoning Rory Gallagher at one of his concerts. They were going to tranquillise him with ferret poison and skin him alive, then wear his skin as a suit and go back on stage. As always the story was very detailed, poetic and dark. He then introduced his guest, David McWilliams who is a well accomplished economist, as well as an author, a journalist, a documentary-maker and a broadcaster. He is a Professor of Global Economics at Trinity College Dublin and is ranked 10th most influential economist in the world. David talked about the economy and brought it to life by linking how people earn, borrow and spend to society and culture. Him and Blindboy discussed how the recession came about, and how David was one of the few to predict the crash. “The truth is that in 2008, the Irish economy was set up to crash.” he said, “because if you have banks borrowing money for three months and loaning it out for 30 years there is other possible outcome”. He explained how this eventually led to the housing crisis, as large amounts of property were bought up, especially apartments, by Vulture Funds and then hoarded or rented out at high prices. They also discussed the Take Back the City movement and how we could solve the housing crisis moving forward. The audience seemed inspired and were very active during the short period at the end reserved for questions. The Dublin Podcast Festival ran from the 26th of September to the 17th October 2018. It featured well known Podcasts such as The Guilty Feminist by Deborah Frances-White, The Adam Buxton Podcast and the Conspiracy Guys.